* Rates as low as 0% for 72 months in the U.S. Offer valid on select models and subject to credit review and approval through AGCO Finance LLC. Dealer participation may vary. Contact your participating dealer for more details. Offer subject to change without notice. 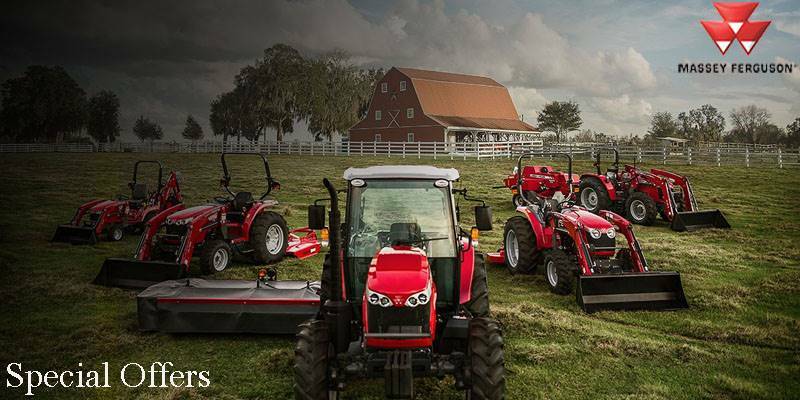 † This offer is eligible through Woods dealers authorized to sell Woods Massey Ferguson Program Red Implements. Limit of one instant rebate per tractor. This offer will be instantly redeemed upon purchase through your local authorized Woods dealer. A full list of qualifying equipment and products. Offer valid on select models and subject to credit review and approval through AGCO Finance LLC. Dealer participation may vary. Contact your participating dealer for more details. Offer subject to change without notice. * Rates as low as 0.25% for 36 months in the U.S. Offer valid on select models and subject to credit review and approval through AGCO Finance LLC. Dealer participation may vary. Contact your participating dealer for more details. Offer subject to change without notice. * Rates as low as 0.50% for 36 months in the U.S. Offer valid on select models and subject to credit review and approval through AGCO Finance LLC. Dealer participation may vary. Contact your participating dealer for more details. Offer subject to change without notice. * Rates as low as 0.50% for 48 months in the U.S. Offer valid on select models and subject to credit review and approval through AGCO Finance LLC. Dealer participation may vary. Contact your participating dealer for more details. Offer subject to change without notice.